This creamy Vegetarian Tomato Risotto is infused with flavor from a San Marzano tomato broth. It just might be better than your grandma's risotto! Start by preparing the tomato-vegetable stock. 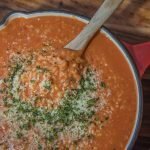 In a large blender, puree the San Marzano tomatoes and vegetable broth. Work in batches if your blender is not large enough. Set aside. In a large pot, heat 1 tbsp of the butter. Add onion and cook for 3-4 minutes, until starting to turn golden. Add the garlic and cook for additional 30 seconds. Add the Arborio rice. Stir to coat with the butter. Cook for 3-4 minutes, until just lightly toasted. Stir constantly to prevent burning. Turn heat to medium-low. Add 1/4 cup of the tomato-vegetable stock and stir slowly until fully absorbed. Continue to add liquid into the rice in small increments, about 1/4 cup at the time. Each time you add liquid, slowly stir the risotto until the stock is fully absorbed into the rice. It is a slow process - it will take you 45-60 minutes to get all the liquid into the risotto! Hint: If you go to quickly and feel like you need additional liquid, just use some extra plain vegetable broth or even a bit of water. Taste the risotto when you think it's done. If it's not tender (to your preference) yet, cook longer. Continue adding liquid so the risotto retains a slightly soupy quality. When the risotto is cooked to your liking, stir in the remaining butter and the Parmesan cheese. Season with salt and pepper. Serve garnished with basil and extra parmesan cheese.